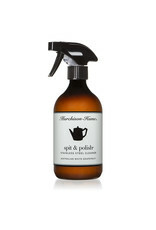 How to use: Shake bottle, spray onto a lint-free cloth and apply to surface in the direction of the grain. Rub until dry. Natural: In most cases, we’re 99% natural. The 1% is in the fragrance (perfume) that we have to add to the essential oil to make it stable. We intentionally keep our fragrances light, yet beautifully aromatic. Good to know: The trace amounts of perfume aren’t environmentally significant.